I participated in Mom Blog Tour Sweets & Snacks Expo (#MomBlogTourFF) on behalf of Wendy’s Bloggers. I received Loacker products to facilitate my post, but images and content are my own. Summer is the best time of the year to relax, unwind, and enjoy the outdoors on our patios while dining al fresco! The heat of the day is hardly the time to crank up the oven to bake. In fact, the only baking I like to enjoy during the summer is baking in the sun to a light golden brown! Growing up in an Italian family, and marrying an Italian all lend to my affinity for Mediterranean style dining. Spending time in Italy reinforces my ease of creativity when it comes to serving food. Mediterranean style dessert options look amazing when presented and they are effortless to prepare. We grill and chill and we use these amazing Mediterranean-inspired summer desserts to lavishly live food and summertime out loud! Before you can even prepare Mediterranean-inspired desserts you have to know which products to purchase. I have a favorite brand that I turn to over and over. I actually got to meet with the folks behind the brand at the recent Sweets & Snack Expo in Chicago! The eponymous family-run business founded by Alfons Loacker in 1925 started regionally and grew globally. Today Loacker products are available in more than 100 countries. Its products are made and packaged in the Dolomites (an area in Italy between the Province of Belluno, South Tyrol and Trentino. The area is also known as the ‘Pale Mountain’ in the northern Italian Alps). 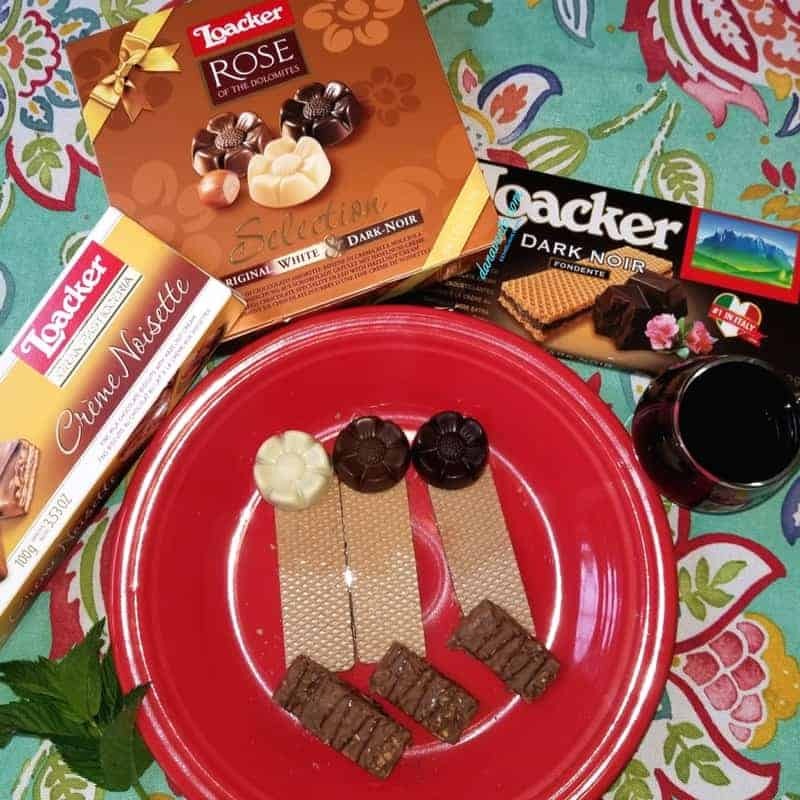 Loacker is known for its wafers, premium pastries, chocolates, and pralines. The products offer nothing but pure goodness and the products do not contain colorings, hydrogenated fats, or preservatives, which sets them apart from all other wafers! Loacker is committed to end world hunger and to empower moms. Learn more about PowerMom. Connect with Loacker on Facebook, Pinterest, Instagram & Twitter. What’s light, airy and delicious, and served in a bowl of Gelato? 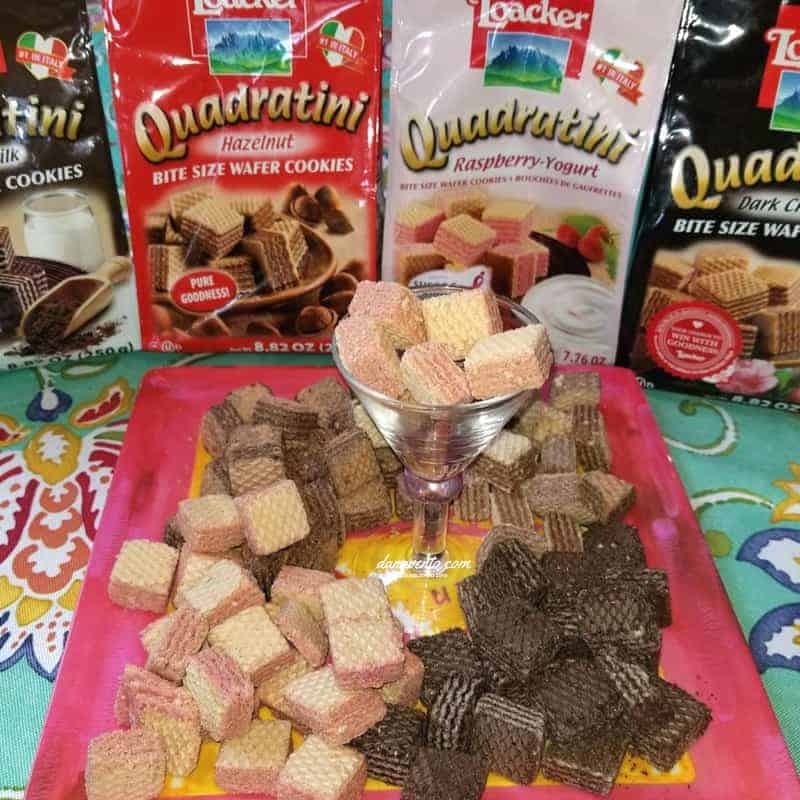 From sorbet to your favorite flavor of gelato or ice cream, Loacker’s Quadratini are perfectly aligned with flavor to pair with your favorite cool treats. Find a lovely glass (margarita, martini, etc.) scoop and add bite-size Quadratini wafers around the inner rim of the glass. You can serve the ice cream, gelato or sorbet with a spoon, but you might find yourself and your guests scooping it with the mini wafers. Aqua gaseosa is the beverage you’ll want in your glass and Loacker LEMON crispy wafers that are filled with lemon cream are what you will want in your hand. This is the perfect couple. Sparkling water and the lemon-crisp wafers are divine. It’s true that wine and chocolate are a marriage made in heaven and when coupled they are perfect for dessert as well. The Loacker ROSE Of The Dolomites offers a box called ‘Selection’ and inside you will find: Original, White and Dark-Noir, perfect for indulging in while sipping your wine. Tucked inside the ROSE is the best of hazelnut cream offering pieces of roasted hazelnut. For me, it’s the final presentation, the rose petals. You could use these fine chocolates to decorate a cake, cupcakes or you can just serve them with a lovely glass of Red or White wine depending on your preference. Rather than turning up the heat of the oven turn on the cafe star in your kitchen and brew yourself a cappuccino, espresso or a well-brewed cup of coffee. Serve these beverages hot, or ice them and enjoy them with Quadratini Espresso or Dark Chocolate bite-sized wafers. If you have ever dined in Italy, you know that one platter of food rolls out after the other, and just when you thought you were done eating, the next platter arrives. We cherish our trips to Italy and we love the ‘platters’ of food that come out so here is my take on that inspired by many meals at our families’ homes in Italy. Keeping the flavors light and try the Raspberry-Yogurt or the Vanilla flavor for this platter. What’s better than offering ONE of something? The Mediterranean style is offering many of something, opening our homes and our pantries to our guests and a little is never enough. We thrive on feeding, and sharing so here is a grand platter that has a little of this and a lot of that. If variety is the spice of life Loacker is the Demi-god of sweet! The cross of sweet, crunchy, chewy and light allows a platter mix to be enjoyed by all as there’s something for everyone. What have I stacked on this platter? Lavishly live summer sweets and eats out loud keeping it simple and light! Every one of these offerings is amazing and fresh! Now, are you ready to try some? My trip to Italy was amazing! I tried so many amazing dishes – I love the look of your Fruit & Wafers platter! Great post! thanks for sharing! sparkling water with sweet wafers? thats something new I have to try this time. I’d like to try FRUIT & WAFERS. It sounds like a good combo! party platter all – theeee – way !! Wafers are literally my favorite and topped with strawberry! omg this looks so delicious right now. I haven’t had wafers in a long time, maybe I should try this recipe. Wow that ice cream cup looks delicious. And what a great idea is to upgrade this regular dessert with these waffles. Yummy! I don’t know much about Mediterranean food although I am always wanting to venture out and try it. These desserts look simple to put together, yet still tasty! Gelato is my favourite dessert in the summer! Love how you’ve paired these wafers perfectly with each dish so well. I’d love to try Loacker products but unfortunately they don’t sell here. All of the desserts here look scrumptious. I don’t believe that I have ever had the snacks from that company. I am surprised that I wouldn’t see them out here at all. I love the fruit and waffles inspire dessert most of all I think.